SUBHEAD: ‘Flash drought’ could devastate half the High Plains wheat harvest this year. Image above: Firemen fighting the recent Bridge Coulee Fire in the High Plains.Photo by Bureau of land. From original article. It’s peak hurricane season, but the nation’s worst weather disaster right now is raging on the High Plains. Rainfall across the affected region has been less than half of normal since late April, when this year’s growing season began. In parts of Montana’s Missouri River basin, which is the drought’s epicenter, rainfall has been less than a quarter of normal — which equals the driest growing season in recorded history for some communities. The drought already has far-reaching effects. 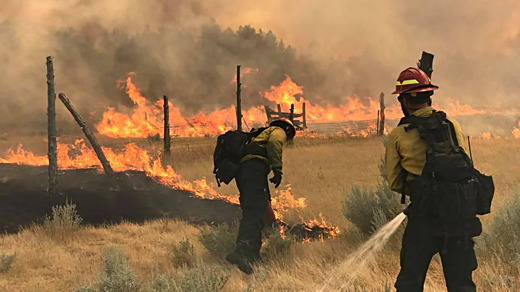 In eastern Montana, America’s current-largest wildfire continues to smolder; the 422-square-mile Lodgepole complex fire is one-third the size of Rhode Island. It’s Montana’s largest fire since 1910. Across the state, 17 other large fires are also spreading. “We haven’t even hit our normal peak fire season yet,” Fransen says. Recently, as the climate has warmed and crop suitability has shifted, the Dakotas and Montana have surpassed Kansas as the most important wheat-growing region in the country. The High Plains is now a supplier of staple grain for the entire world. According to recent field surveys, more than half of this year’s harvest may already be lost. The economic impact of the drought and related fires may exceed $1 billion across the multi-state region by the time the rains return. Donations of hay for beleaguered farmers and ranchers have come in from as far away as West Virginia. Farmers in the region are also worried because the Trump administration has targeted a key federal crop insurance program for hefty cuts. The governors of North Dakota, South Dakota, and Montana have all declared states of emergency to speed aid and open some normally protected areas for livestock grazing. Droughts are often thought of as creeping, slow-motion disasters. They usually don’t grab headlines like hurricane landfalls, even though they represent the costliest weather-related catastrophe worldwide. But this drought is an anomaly, a “flash drought.” It essentially came from nowhere. It didn’t exist just three months ago. The frequency of these rapid-onset droughts is expected to increase as the planet warms. A recent study focusing on China found that flash droughts more than doubled in frequency there between 1979 and 2010. Droughts like these are closely linked to climate change. As temperatures rise, abnormally dry conditions across the western United States are already becoming more common and more intense. And as evaporation rates speed up, rainfall becomes more erratic, and spring snowmelt dries up earlier each year. Future summers in North Dakota are expected to be even hotter and drier, on par with the present-day weather of south Texas. On Whitney Klasna’s ranch in Lambert, Montana, the spring rains “just didn’t come this year.” Klasna has already seen 60 to 80 percent crop losses in her fields, and now she’s making calculations about which of her cattle she can afford to save. She and her crew are working to drill an additional water well and install a pipeline to keep as many alive as possible. Now they’re worried that, if the rains do come, they’ll lead to flash flooding; the ground has essentially been transformed into concrete. Klasna calls the drought a “perfect storm of bad luck” and expects its impacts to last for years. Further west, near where the Lodgepole complex is burning, Sarah Swanson runs a John Deere dealership, one of the biggest businesses in her community. She hears heartbreaking stories from across the region, with many farmers and ranchers working together to fight the fire with their own equipment. Last week, Swanson wrote a personal letter to Interior Secretary Ryan Zinke, a Montana native, asking him to ease grazing restrictions on a nearby wildlife refuge. Two days later, he did so.